The Bryce Harper saga continues to loom over the Washington Nationals' offseason. As everyone waits to see what's going to happen with the superstar free agent outfielder, CBS Sports HQ MLB analyst Jim Bowden sat down with Washington Nationals general manager Mike Rizzo at the MLB Winter Meetings in Las Vegas to get some clarity on the team's current relationship with Harper and to break down the Nationals' signing of free agent starting pitcher Patrick Corbin. Before winter meetings got underway, the Nats announced that they agreed to a six-year deal with Corbin. Reports have indicated the deal is worth $140 million, per Jon Heyman. "He made our focus list and it was no secret that we were looking for a top of the rotation starting pitcher to put in there with our two big guys [Max Scherzer, Stephen Strasburg] and Corbin was at the top of our list," Rizzo told Bowden. "I think his best days are head of him not behind him and we felt that with his athleticism and the way he prepares that the six-year was something that we were willing to do." But the biggest question of Washington's offseason still remains: Will they be without the face of their franchise in 2019? It's tough to tell if Harper has much interest in a D.C. reunion at the moment, but Rizzo told Bowden that Washington is "never going to close the door" on the possibility of re-signing Harper. This comes just after managing principal owner Mark Lerner told 106.7 The Fan, a CBS station, last week that the Nats' $300 million offer was the "best we can do." The comment refers to Harper reportedly receiving and rejecting an offer from the Nationals in September. 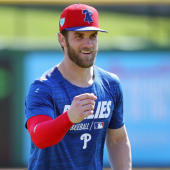 Rizzo told Bowden that the rumors about teams making offers for Harper during last season were true, but they decided that their best chance to win was with Harper. "There were a lot of real offers on the table for him," Rizzo told Bowden. "We just decided that we could play better and contend so we didn't make the trade. We felt that our best chance to win was with Harper so we didn't make the trade but there was a lot of offers out there and a lot of interest." When Bowden inquired about whether or not there's enough money to sign Harper after the Corbin deal, Rizzo said that the door isn't closed on Harper. "We love Harp, we love to have him on the club, we're never going to close the door," Rizzo told Bowden. "He's a guy that's near and dear to my heart, and a great player." So with the Nats on the fringes of the Harper sweepstakes, where are the 26-year-old's most likely landing spots this free agency? The Los Angeles Dodgers would have to trade some of their outfielders to make a Harper deal work, but they're in the running according to Bowden. So are the Philadelphia Phillies and Chicago White Sox -- both teams have money to spend and would love to have Harper as the face of their franchise. And what about the New York Yankees? Well, after Brian Cashman's comments about liking their outfield the way they have it now, it appears they're not chasing after Harper. Bowden also reported that the Yankees analytical department values outfield defense, one of the few metrics where Harper doesn't measure up to his peers. We'll be keeping track of all the rumors happening at the 2018 MLB winter meetings. Follow along with our daily rumors roundup articles. Here's everything you need to know from Tuesday.